It wasn’t so long ago that quesadillas—chewy-crisp flour tortillas filled with gooey melted cheese—burst upon our North American culinary landscape. It was love at first bite. In Mexico, quesadillas are traditionally cooked on a comal (a flat skillet). They can be baked in the oven, as is often the case in the United States. Now, I’m of the school that if something tastes great off the griddle or out of the oven, it probably tastes even better off the grill—even when that something is as flammable as a flour tortilla. The secret to grilling a quesadilla is to lower the heat and keep the cooking time brief in order to melt the cheese without burning the tortilla. It also helps to have a safety zone where you can move the quesadilla if it starts to burn (see the Tip on page 406). The effort is well worth it. Tortillas burn like paper. When grilling quesadillas, don’t take your eyes off the grill for a second. It’s a good idea to have a cool zone on your grill (see building a Three-Zone Fire, page 10, for charcoal or Direct Grilling, page 16, for gas). That way, if the tortillas start to burn, you can move them to safety. To set up a charcoal grill for direct grilling, first light the charcoal in a chimney starter (see page 9). Using a garden hoe or other long-handled implement, rake the burning coals into a three-zone fire (see page 10). A three-zone fire gives you a coal-free safety zone. 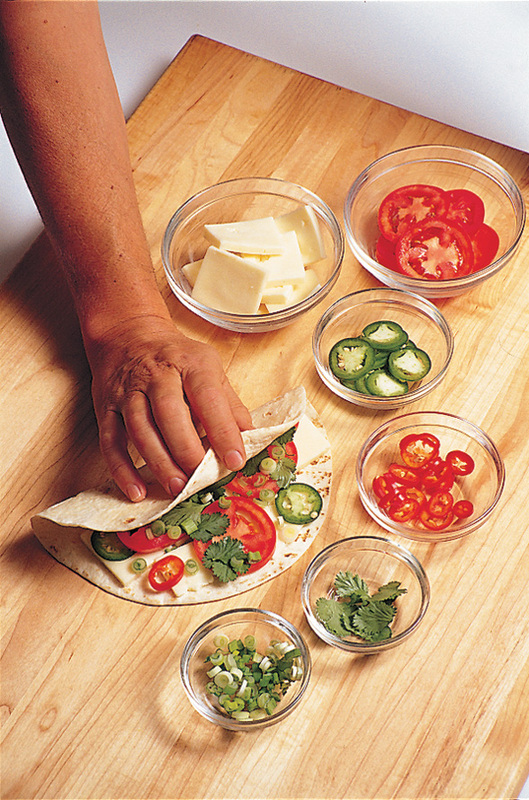 Arrange the cheese, tomatoes, chiles, scallions, and cilantro on half of each tortilla. Fold up the tortillas over the filling. On the grill: Grill the quesadillas until the tortillas are nicely browned and the cheese is melted, 1 to 2 minutes per side. Brush the quesadillas with melted butter as they grill. Place the tortillas on a work surface. 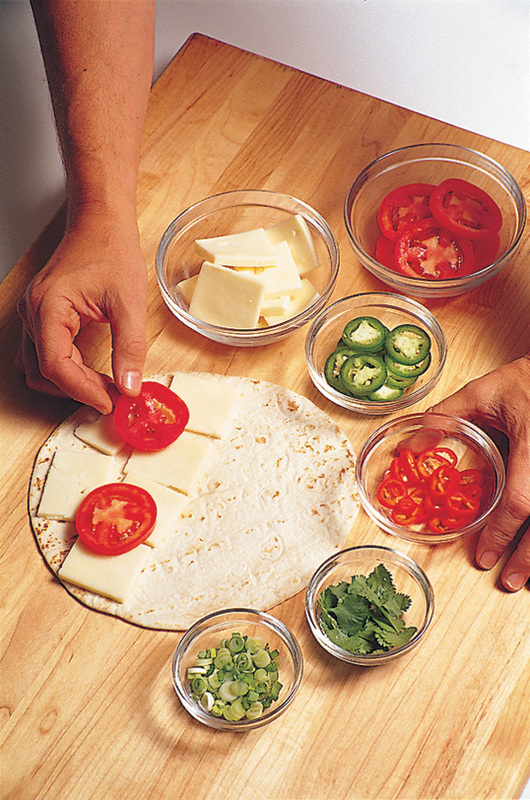 Arrange a few slices of cheese, tomato, and jalapeño on half of each tortilla. Top with some scallion and cilantro. Fold the tortillas in half. The quesadillas can be prepared up to this stage up to several hours ahead. Wrap the quesadillas tightly in plastic and refrigerate until ready to grill. Set up the grill for three-zone direct grilling (see page 10 for charcoal or page 16 for gas) and preheat the hot zone to medium-high. When ready to cook, place the quesadillas on the hot grate and grill until the tortillas are golden brown and the cheese is slightly melted, 1 to 2 minutes per side. 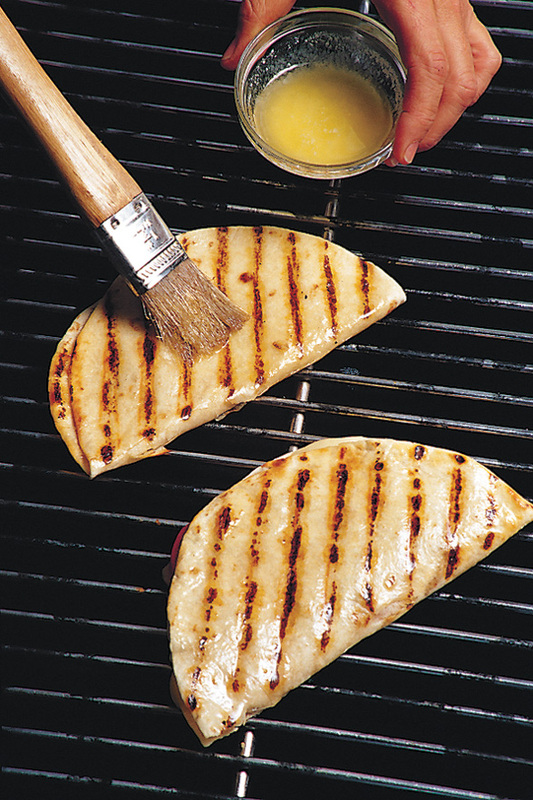 Brush the outside of each quesadilla with the melted butter as it grills. Be prepared to move the quesadillas to a cooler part of the grill if they start to burn. Serve at once either whole or cut into wedges. You can stuff tortillas with just about anything—goat cheese and sun-dried tomatoes, Gouda cheese and roasted peppers, or sliced grilled chicken, duck, lobster, shrimp, or pork. You can also use corn tortillas instead of flour. To be strictly authentic, you’d use grated cheese and diced tomatoes. My method is quicker and gives you a more substantial quesadilla. If you prefer a milder quesadilla, seed the jalapeños. Excerpted from How to Grill by Steven Raichlen (Workman Publishing). Copyright © 2001. Photographs by Greg Schneider.